Am doing some traveling in Bulgaria now. The featured image of this blog post is a map to help you see exactly where I am. (Close to the black arrow.) I like maps because they are precise. Remember, Kostenets is the name of the town where I saw angels for the first time. The town is named Kostenets from the Bulgarian word ‘kost’ which means bone. Past polemics resulted in the discovery of a plethora of bones here, remnants of fierce battles of the past. It is indeed ironic that it is in this ‘town of bones’ that God chose to send a tremendous amount of angels. There’s a nearby valley which I personally refer to as the Valley of Angels. Although Bulgaria is currently known for its Valley of Roses, one day, it will be known for its Valley of Angels. Today, I went to Grand. The Cafe Grand. It’s been a while since I’ve been there. They’ve done some renovations and it was quite pleasant. Even more pleasant was when I saw Everlast walk up the cafe’s ramp. I describe this human angel in my book, Inside the Secret World of Angels. Today, he wore a blue T-shirt, long, blue shorts, sandals and black sunglasses. It was funny seeing him again because he let his hair grow. It’s now shoulder length and curly! At 1:03 p.m., I saw Tania, Nikolai’s wife. She came over and talked to me and Mom. She wore an off-white pant suit and semi-transparent, beige glasses with photochromic lenses. The sun was shining which means that I only partially saw her eyes. She was on her lunch break. I also describe her in my book. Whether you believe me or not is up to you. The truth about the matter is that I thoroughly document what I see and that my books and e-books literally represent thousands of pages and tens of thousands of words with excruciating detail about how angels look, manifest or, appear and integrate into our human society. Oh, I almost forgot to mention that I saw Tse Tse’s girlfriend, too. Not at Grand, though. Somewhere else that I’ll keep secret. She put on some weight since the last time I saw her and now has an elaborate tattoo that runs up and down her right arm. We joked around about the Motel in Dolna Banya (a small town not far from Kostenet on the map, too, south of the black arrow); namely that the pool is due for a cleaning. She mentioned that the gazebo will open in a few days. I went to the Motel in Dolna Banya today because, visiting Bulgaria, I wanted to remember the place where I had seen some of the best angelic manifestations ever. The pool at the Motel in Dolna Banya, Bulgaria in winter. I remembered this particular manifestation because it stood in sharp contrast with today’s nearly empty pool—there were only two people swimming in the Jacuzzi—and said manifestation in which the pool nearly swarmed with angels in disguise. “Yes, I know” she replied. Today, however, there were no angels, only a clean, blue pool with steam gently ascending into a chilly and humid, dull, gray November sky. Interestingly enough, on our way from Toronto to Sofia, as we stepped into Gate 48 of Amsterdam’s International Airport, Schiphol, angels started manifesting. There were angels in disguise on the Bulgaria Air flight I took from Amsterdam to Sofia! And it didn’t stop there. When I had my first swim at the pool after arriving in mid October, I swam with two angels in disguise, a man and a woman. It had been an amazingly warm day with a clear blue, cloudless sky. The young couple had stood next to the banana tree (planted next to the pool’s shower which had been dismantled for the winter season) and looked at me kindly as they touched the tree’s particular, green leaves affectionately. When angels choose to manifest and how is a mystery. There are so many factors involved in angelic appearances, factors we are barely able to understand given our three-dimensional nature, that determine if, how and when a manifestation happens. Today, as I stood (after having eaten a wonderful lunch inside the Motel’s restaurant) in front of the nearly empty pool, I understood one thing: angels appear on their own terms and we must be grateful even when we don’t see them in physical form! Angels are authentic creatures. Regardless, therefore, how they choose to appear, this trait will stand out. Let’s face it, angels are not of this world. There will always be an otherworldly quality about angels in manifest form. Angels, who come from the fourth dimension, have access to information that we do not. This doesn’t mean that they misuse information; it just means that they can access it. Angels are purposeful in everything they do. Remember, angels perform missions that God assigns them. Angels are humble putting service above self. Angels remember, praise and worship God, their Maker. Angels are compassionate. They care about people and our trials. A friend of mine recently asked me to autograph one of my books for her. It felt really good for two reasons: one, as I held the book in my hands—it happened to be Zion, the Holy City of God—I felt, for the first time perhaps, that I was an author; and two, the pen she handed me worked very well. I’ve always struggled with finding really good pens which, in part, is what made autographing the book so pleasurable. Someone on LinkedIn said that when we blog, we should blog Evergreen stuff. It wasn’t all that clear what he meant by that—something to do with perennial content like notes from your author scrapbook that include snippets from the research you did prior to writing your book. He also suggested blogging on a schedule (e.g., twice a week). Well, first of all, I don’t have a scrapbook. I do, however, have notebooks with handwritten text and original drawings. Second, I don’t blog on a schedule; I blog when inspired. As you can see, I’m not the world’s best illustrator. And my penmanship leaves much to be desired. I do try, however, to capture whatever it is I happen to be looking at. I was in Kostenets, Bulgaria at Grand when I experienced this particular manifestation. What you see depicted is my black and white reproduction of a colorful design I saw on a little angel boy’s black T-shirt. As hard as this may sound, I interpreted his print as a festive interpretation of death. I hope you found this blog post interesting. God bless and may you see angels. In Genesis, Jacob dreams of a ladder. Since travel happens interdimensionally, though, it is incorrect to think of movement over distance. Yet, as mortals who live in the third dimension, it is almost impossible for us not to do so. That’s because we need reference points. 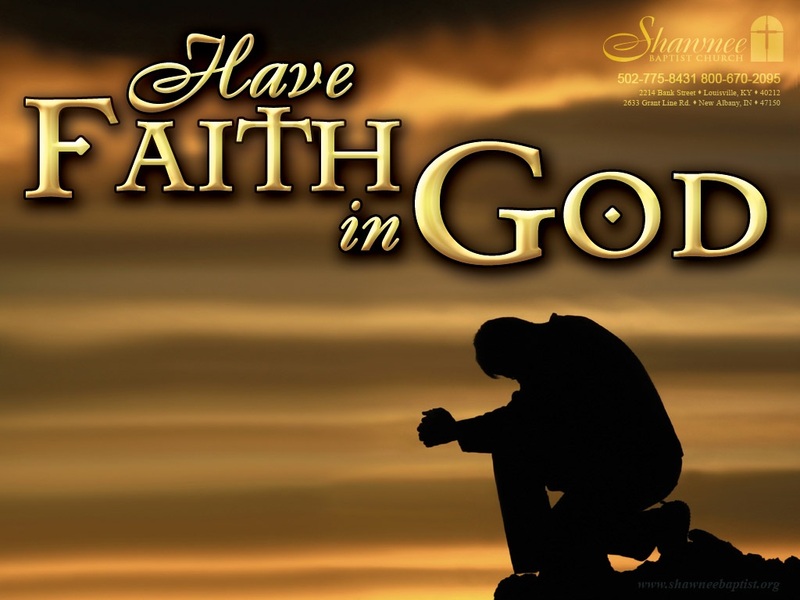 Angels are faithful because God is faithful. Since angels work for God, they faithfully perform the missions he assigns them. They faithfully go “back” and “forth” bridging the gap between corporeality and immortality. Guardian angels have wards. They spend much time, therefore, thinking about their wards and figuring out ways to help them. I know this to be true because that’s exactly what my guardian angel does for me 24/7. I write about this extensively in my angel books. God assigns angels to us because we are important to him. We are precious and valuable. We matter to him highly. Because the fourth dimension—where angels live—never “sleeps,” our guardian angel is ever aware of what we’re doing. Every breath we take is felt by them. This is how close angels are to people and how much God loves us. There is an age-old relationship between people and angels. If you believe that you have a guardian angel watching over you and that this angel is faithful to you from the moment of your birth to the time you pass away, then you’ll understand the depth of God’s love for you. If you understand this concept, it will affect your behavior. I’ve heard faithful people say that they no longer do things that will upset their guardian angel. This is because they are now able to consciously feel and appreciate their guardian angel’s presence, love and fidelity, and understand the responsibility involved in being a ward. There are numerous, biblical examples that pertain to angels appearing on earth (for a detailed account, see my book, Lessons from my Guardian Angel). One of my favorite examples is when Father Abraham entertains angels in disguise. 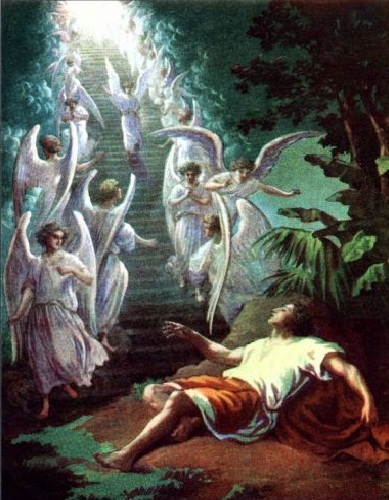 (Genesis 18:1) He didn’t know that angels would come calling, but he never stopped moving once they arrived. He served them nonstop, giving them the best he had, even though they were strangers disguised as Arabs, people he’d presumably never seen before in his life. Legend has it that these three “men” were none other than the Archangels Michael, Gabriel and Raphael. When angels come calling, they come in disguise or, incognito. That’s because angels, 100% made of light, appear so bright in their true form that it would overwhelm—possibly kill—us if we were to see them in their true form. That’s why they appear disguised. Angels can do this because they live in the fourth dimension, one step up from our third dimension world. In the fourth dimension, things like war, hate, crime, lies, and disease do not exist. In the fourth dimension, communication happens on a higher level than on earth. Angels communicate telepathically and speech is only used for creative functions like singing. In order to understand the fourth dimension, we need to perform a radical shift in our thinking. They say that there are millions of angels who worship God on the Mount of the Congregation, positioned in front of his temple in heaven. Angels, however, are not static beings who hang out on clouds twiddling their thumbs. Angels are active beings who move back and forth between higher dimensional space and our third dimension world. As God’s representatives, they have wards and perform missions that God assigns them. Haven’t you heard the testimonials, too numerous to count, where people claim that an angel or angels in disguise rescued them from certain tragedy? Billy Graham calls angels “God’s secret agents.” I believe that he coined this term because of the mysterious aspect connected with the way angels appear on earth. They must appear disguised in order to be able to complete their heavenly assignments. As we go through our daily lives, we need to be ever ready for the unexpected, the unexpected being the way in which God moves in our lives. It rarely happens the way we think or believe. It’s most often original, amazing and breathtaking. If you want to see angels, one of the things you’re going to have to learn is patience. There were many times when manifestations were supposed to happen, but didn’t. This is because angels work on their schedule, not mine. Angels appear when they want to, not when I want them to. It’s imperative, therefore, to follow the instructions your guardian angel gives you, be patient, and not get upset if things don’t happen the way you thought they would or think they should. Manifestations are often aborted for reasons that are outside our purview. The best thing to do after you’ve received instructions is to wait. Yes, wait. I know, it’s not a lot of fun to just sit around and wait, but that may be precisely what you’ll need to do to learn patience, gain your angel’s trust, and be included more and more in the manifestation process. In The Truth about Angels, Part I, I talk about how you you may have to strike a pose while waiting. Striking a pose may mean positioning your body in such a way as to not attract attention to yourself as you wait for your angel to manifest. How you do this—and you’ll need to be creative—will depend on your circumstances. I also discuss invisibility moves. This could involve: reading a newspaper, magazine or book; appearing to be absorbed in your cellular phone; picking at your skin, etc. These are very human practices and gestures that make you fit in and make others both accept your presence and not give you a second thought. In other words, performing such practices and gestures will give you the luxury of observing without being noticed. I also explain how manifestations happen with a certain order. Unlike our third dimension, the fourth dimension—one step up from ours—is very ordered. Angels do things in a certain, prescribed order. They don’t operate with the chaos and confusion that often characterize our third dimension. For example, my guardian angel has a perfect memory and remembers everything I’ve ever said! If hearing such a thought disturbs you, imagine what it would be like to have a relationship with a being who has this capacity. Life offers a smorgasbord of learning experiences. Some are pleasant, others wonderful, yet others disturbing, distressing and debilitating. Without the help of angels—and more specifically—our guardian angel, we wouldn’t be able to make it through the most difficult moments of our lives. Whatever happens on the physical level of our existence is supported by the non-physical. This means that no matter what life throws at us, we are supported in the most perfect way. The whole idea is to learn how to reach out to your guardian angel and develop the intimate relationship that will enable you to build the faith it takes to get you through anything in this world. Although I started writing novels in 2001 to heal from a broken marriage, it wasn’t until 2008 that I hit upon my passion: writing books about angels. In retrospect, I can tell you without hesitation that I didn’t get published because I was trying too hard and hadn’t yet discovered my passion. My inspiration—the peak experience that led me onto the adventure of a lifetime, writing books about angels—came like a bolt of lightning out of the blue. It wasn’t anything that I ever expected or dreamed would happen; and it certainly wasn’t anything that came from within me. I remember being at Katarino Spa—a resort in Razlog, Bulgaria—when it happened. Everything was happening perfectly in my life. I was enjoying a winter holiday when, out of the blue, bam!, I had a mystical experience that would forever change my life. It was, in my opinion, a mere coincidence that I was at Katarino Spa when I had the mystical experience. I could, in fact, have been anywhere, but it just so happened that I was there. I remember lying in bed, looking at the soft light of the moon as it filtered through the window’s delicate curtain, when I had what can only be described as a paranormal experience. I ‘saw,’ ‘felt,’ and communicated telepathically with my guardian angel. Before this event, I never thought much about angels. 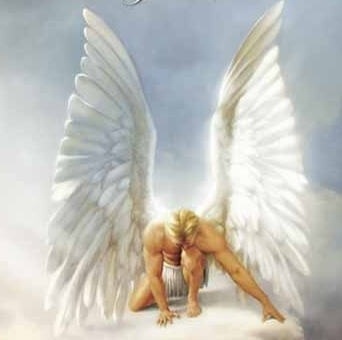 Although I’d studied at divinity school and had a theoretical understanding about angels, I never considered them let alone thinking that I might have one, specific, guardian angel. Once the vacation ended, I kept remembering the experience. I kept thinking about what I’d felt and what I’d learned from the mystical experience. I began focusing on my guardian angel and ‘inquiring’ of them using my mind. When I got back home, I couldn’t stop thinking about my guardian angel and even went ‘angel hunting,’ a no-no in the realm of angelic experiences. That’s because angels seek out people, not the other way around. Of course, I didn’t know that then, and made that mistake. The peak event, my eureka moment, was the starting point of a journey that would lead me to write books about angels. It helped me understand that I didn’t need to struggle to write books; that books, rather, would be delivered to me on a platter. When I say this, bear in mind that I still had to take pen and paper or type on a keyboard in order to document the story. But I stopped struggling altogether. I just finished preparing a promotional review for my e-book, Pocket Prophecies. If all goes well, it should be available on askDavid.com soon. I’m determined to have this e-book become available in print form, too. In the meantime, I’m counting on your patience. 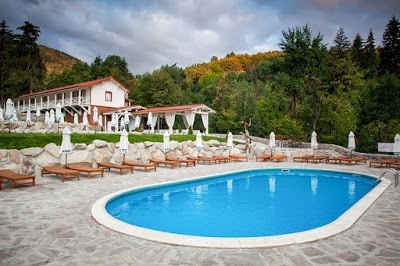 As I wrote what I thought was a fairly good description of the book, I reminisced about the place where I was inspired to write it, a hotel restaurant complex in Bulgaria called “Ezeroto.” It’s close to the town where I was inspired to write my angel books and I thought you might like to see a few images of the place. The structure in the back has changing cabins. 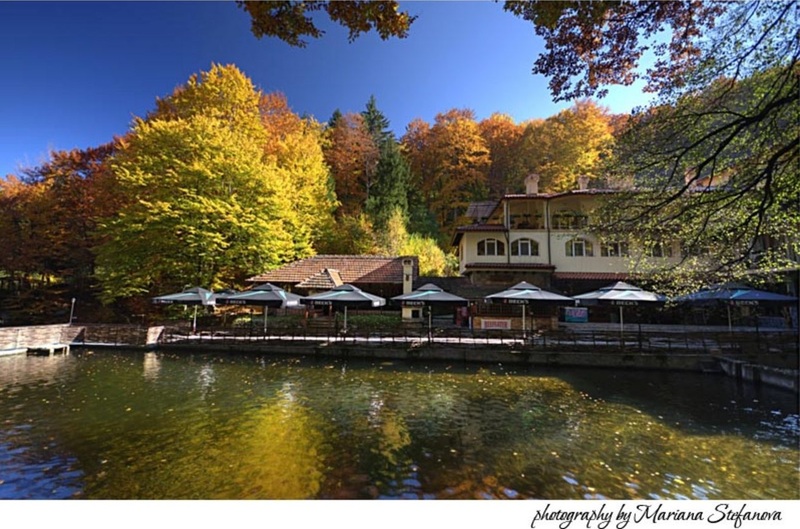 What I like about “Ezeroto”–in addition to its traditional, Bulgarian menu and refined cuisine–is the fact that it contains an animal sanctuary. There are pheasants, deer, and rabbits. 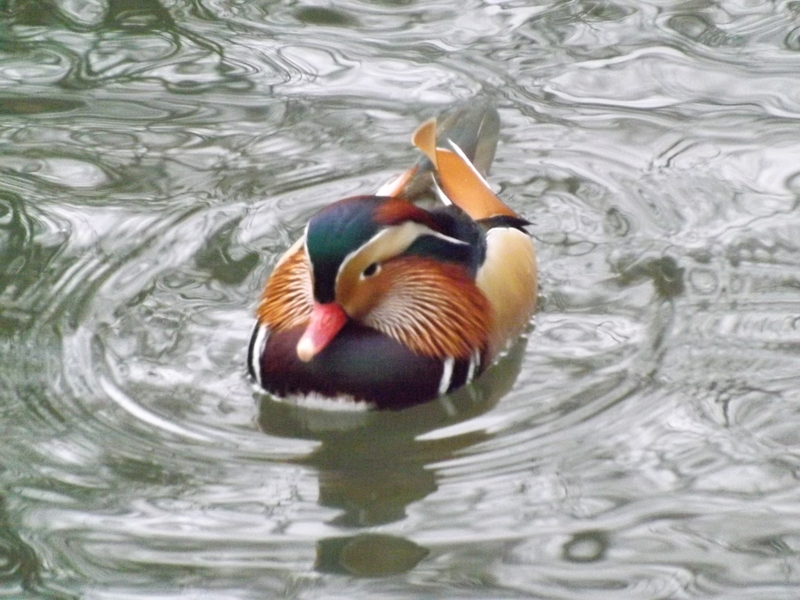 The owner was able to procure the most unusual ducks that live in the man-made lake. They are multi-colored. 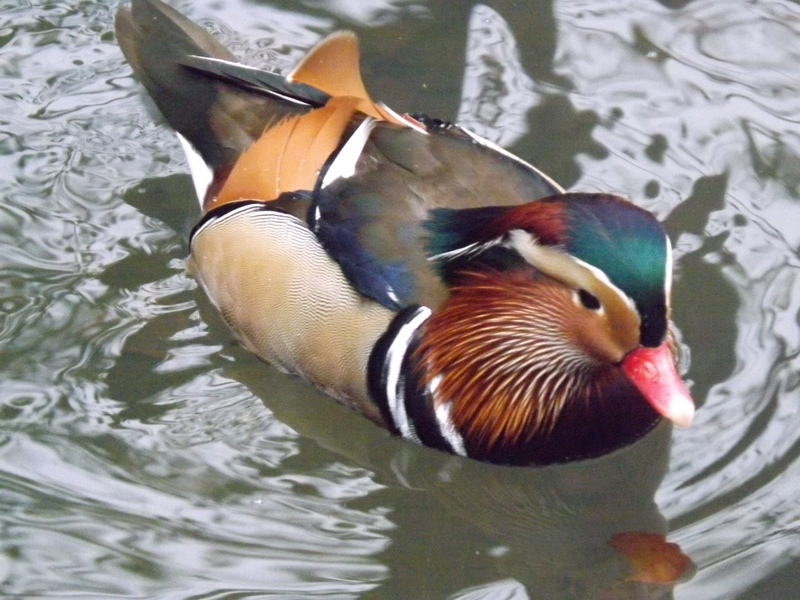 Look at these digital images I took of one of the ducks. Have you ever seen such a fascinating duck? It was a first for me! The way I got the ducks to approach me was to…, you guessed it, throw bits of bread into the lake. They came, but didn’t stay long which made photographing them difficult. It would seem that they are as elusive as they are beautiful. Image credit: The Official website of Pchelin village. I cannot say in words just how peaceful standing next to this waterfall was for me. All of my worries would slip into the pristine, cascading water leaving me feeling refreshed. 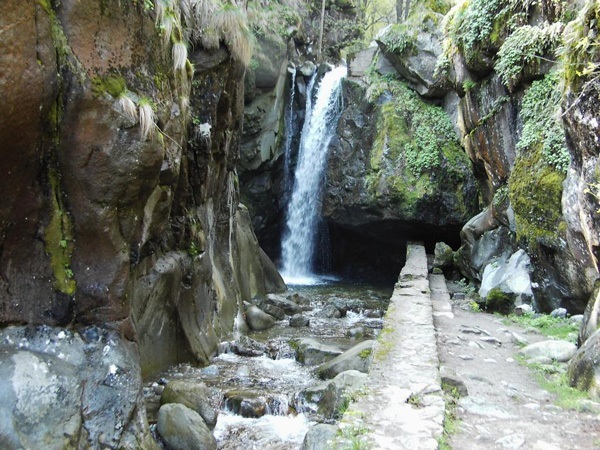 There’s a path that leads up from “Ezeroto” to “Gurgulitsa,” a refuge where hikers can spend the night and order a bowl of soup or hot cider, for example. 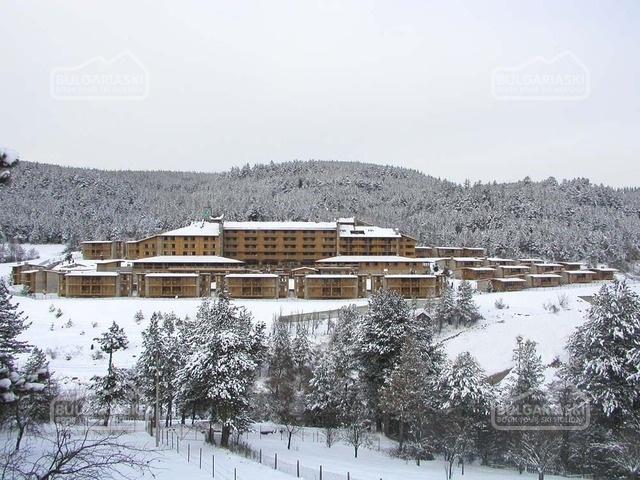 “Gurgulitsa” is beautiful year-round, but hard to reach in winter when there is an accumulation of snow. This is a picture of the view from the refuge’s balcony. You can see how thick and green the adjoining forest’s foliage is. 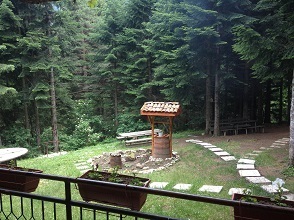 I visited “Gurgulitsa” many times and sat on this very balcony enjoying the view. I hope you enjoyed this post. Thanks for stopping by. The Café Grand brings back a lot of memories. It’s located in the town where I first started seeing angels. 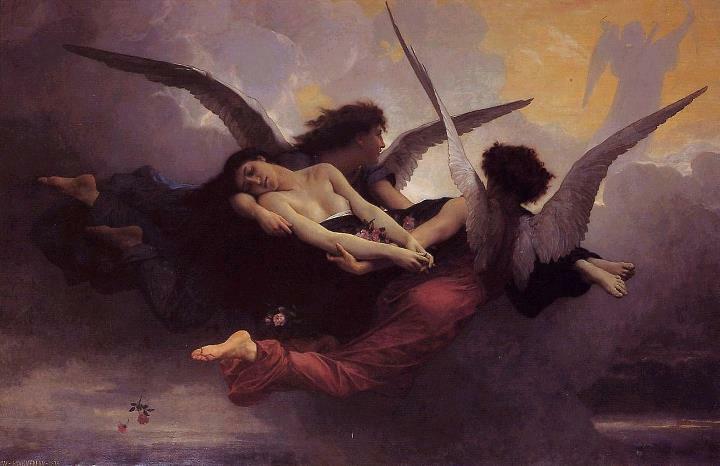 I mention the name of the town in the preface of my book, The Truth about Angels, Part I. 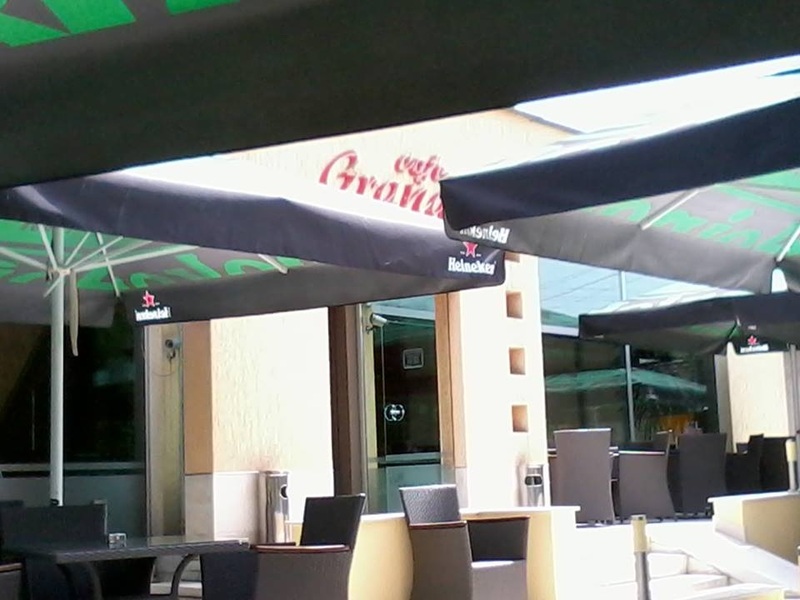 The Café Grand, which I affectionately call Grand in my book (natives call it ‘Granda’), as well as whenever I refer to the establishment, offers a wide assortment of coffees. They also serve ice cream, sandwiches, chips, and alcoholic beverages. In Bulgaria, it’s legal to serve alcohol in coffee shops. Do you see its name in red above the umbrellas? They say that you can learn much from observation. This is true. 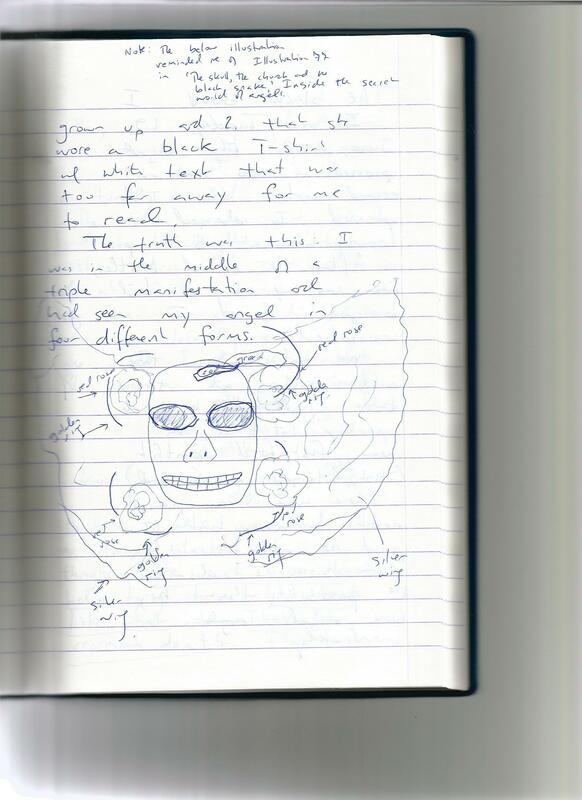 In the beginning, I would always make sure to have pen and paper ready to take notes (and sometimes draw pictures) about what I was seeing. Over time, though, I learned how to memorize what I saw. I did this in order to be more discrete about what I was doing. The waitresses knew that I was a writer and would smile when they’d see me scribbling on pieces of paper or napkins. I didn’t mind, though, because I was secretly documenting a prolonged phenomenon that would end up being The Truth about Angels, Parts I & II. I’ve had many wonderful and inspiring conversations with my guardian angel at Grand. I talk about these conversations and what came out of them in my book. In fact, I don’t just relate them, I give readers a detailed account of how the conversations unfolded, the context in which they transpired, and how they profoundly helped me. You cannot witness angelic manifestations and remain the same. Being exposed to and participating in prolonged, supernatural phenomena will change the way you understand the world. It will amaze, infuse, energize, enthuse and inspire you like never before. I hope you enjoyed my second blog post. Stay tuned for more.